Happy 3 years Tea and Fog! I was so excited I took myself to Japan to celebrate! No, that's mostly just coincidence, but it's a nice idea! At the moment I’m writing this from the bullet train from Kyoto to Tokyo, which makes me feel very professional. Strange, I never do any work en route when I travel for my job! Perhaps they should send me to Japan, where the WiFi so far on public transit has been excellent. But right now I want to talk about this cake, because oh.my.goodness. is it good! 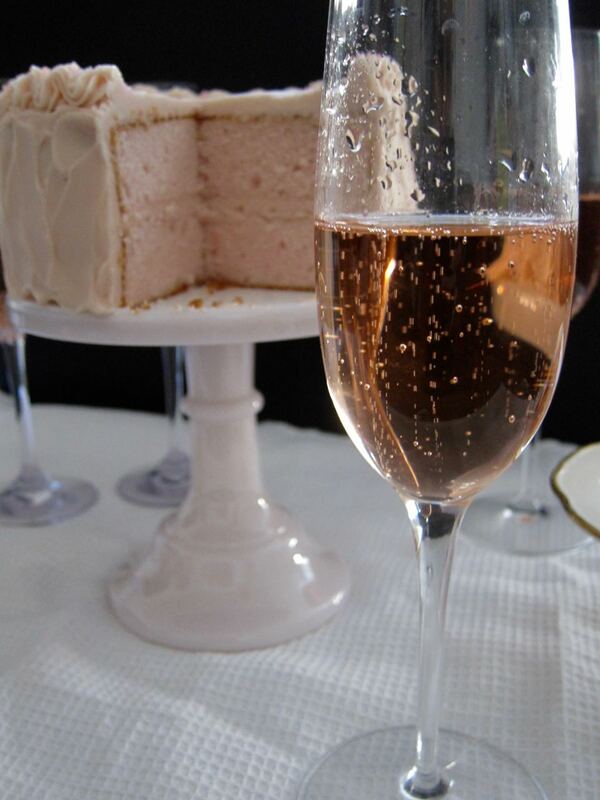 It’s a pink champagne cake, it all its retro glory. I’ve only ever seen it before at the Madonna Inn in San Luis Obispo, where they dye the frosting to more of a neon shade of pink (I opted for more of an off-millennial pink). I didn’t try theirs but now I think I might need to take a road trip. Because, don’t let the vintage vibe dissuade you. Fluffy cake gets stacked with a matching, blush-hued buttercream frosting sweet enough to curl your teeth, but the whole sugar rush is tempered by the zing of a dry, pink champagne mixed into both cake and frosting. I’ve made this recipe twice so far and it has been perfect every time. My friend Mike told me it was the best cake he’s had in 10 years, which I would take full credit for except I didn’t even tweak the recipe except to halve it (and even the small version is a lot of cake for just me). But I will take points for execution! It’s perfect for all happy occasions, when you are probably already going to pop a bottle of champagne. Here, you can just add some to the cake and then drink the rest! I made it to celebrate three years of blogging (because I love celebrating these anniversaries with champagne), but also for New Year’s, and I have plans to adapt it for a fun take on a mimosa for my friend’s bridal shower (shh, don’t tell her). I would also fully endorse just making it for any non-occasion too, it is that good, and since you make the most simple of frostings, it comes together in no time. Fancy decor optional, this cake really sells itself. So, I wish I could say I have some big feelings about three years of this blogging thing, but mostly I just feel kind of perplexed, because seriously, where are the years going?? I also have the continual thought that I should be less insane about this whole thing, but…eh. Probably not gonna happen at this point unless someone deletes the list of recipe ideas from my phone. But if you are reading, thank you! I love all the forwards, feedback, and advice! Make the cake layers: Place rack in center of oven and heat to 350 degrees. Butter and flour two, 6-inch cake pans. In the bowl of a stand mixer, beat sugar and butter for 3-4 minutes on medium speed until light and fluffy. Add the flour mixture and the egg white mixture, alternating, starting and ending with the dry mix. Scrape down sides of bowl as needed. Stir in a small amount of pink food coloring to get desired color. Divide the batter between pans. Bake, 20-25 minutes, until cakes are just beginning to pull back from the sides of the pans. Cool on a rack for 10 minutes, remove from pans and cool 30 minutes, or until completely cooled. Make the frosting: beat the butter on medium speed in the bowl of a stand mixer until creamy, about 1 minute. Add 3 cups powdered sugar, champagne and vanilla and beat to combine. If needed, add more powdered sugar to make the frosting thicken and become more spreadable. 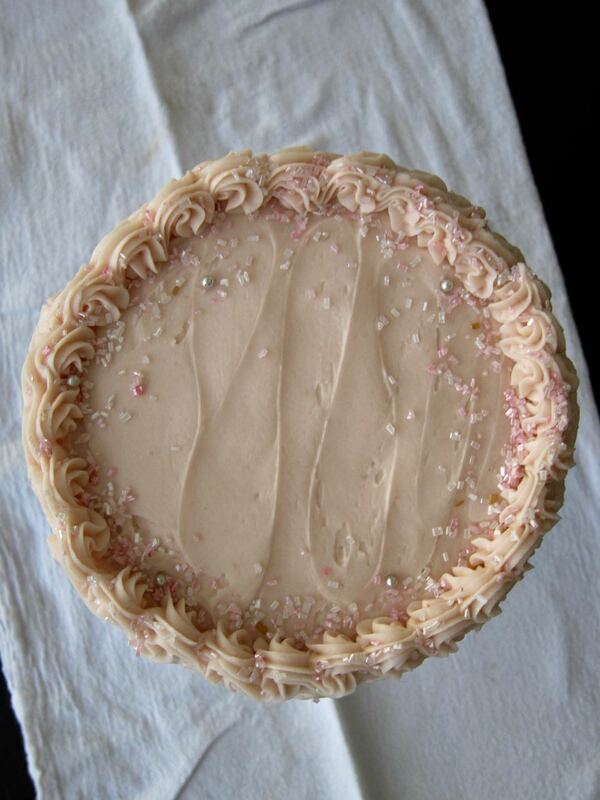 Add desired amount of pink food coloring and beat frosting to fluffy, 30 seconds on medium-high. Assemble cake: Level tops of cake layers. Stack layers, spread with a thin layer of frosting between them, and decorate cake with remaining frosting and any extra decorations as desired.